There is a rhythm and rhyme to unwinding from work. Meeting friends for post-work drinks, wrangling the little ones for a family meal, or swinging on the porch watching the sunset, our after work traditions are a part of our foundation. You can sense the intimacy and excitement of a new season. Enjoyable nights of cool air where a beer or glass of wine are not enough to fight off the chill and allow us to relax. In our search for the best spiked hot beverage, I corresponded with Chrissie Nelson, the blogger behind Charlotte’s Off The Eaten Path (offtheeatenpathblog.com). When she’s not meeting different and interesting people through her job as an attorney and assistant public defender in Mecklenburg County, she’s meeting them in her spare time eating, drinking, and blogging her way through Charlotte. Chrissie started the blog more than two years ago, “I was new to Charlotte and I wanted to get out and explore.” Glancing at her “Where I’ve Eaten” in the Queen City, I think her claim to be fueled by pizza, sushi, a great burger or good steak, hot wings, Mexican food, donuts, cheese, red wine, and craft beer isn’t too far off. No matter your job, position, or career transitioning out of work-mode can be a tricky task for everyone. Give yourself a purpose or a foundation to transition out of the work day. Allowing yourself the opportunity to relax will aid your ability to sustain your life and career. I asked Chrissie to imagine herself sitting on a porch swing, enjoying the early evening air. The sun setting beyond the trees, the sky turning warm colors transitioning into darkness. The day’s, the week’s worries melting away. A blanket laying over your lap to ward off the chill in the air. A warm mug in your hand that you bring up to sip. What is in the mug? And with that, I found the base for a few recipes to unwind after a day’s work. Before we can mix up a great drink, we’ll need to prepare the base. Swing by your local Farmer’s Market and pull out the trusty crock pot. Make enough for the week and store it in the fridge, so it is ready for you each evening. Crock pot, knife, cutting board, 12” x 12” cheesecloth, food-safe string, drink strainer, and sealable pitcher. 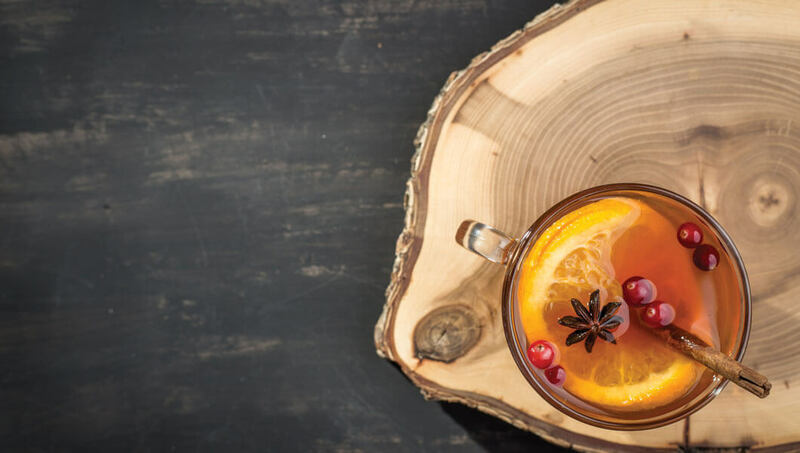 Prepare your immune system for the upcoming cold and flu season and Make It a Toddy. The Hot Toddy has been used as a natural remedy to ease aches and pains associated with the common cold for decades. Unlike chicken soup, the Hot Toddy’s whiskey helps fight infection. The alcohol works in combination with the tea, honey, lemon, and warm steam to dilate your blood vessels and open your airways. This makes it easier for your body to expel the infection causing microbes. The alcohol also helps your body unwind and sleep harder, which is what the doctor orders for the common cold. Instead of running for a bottle of Nyquil, mix up a batch of Make It a Toddy, a local twist to the traditional recipe. We’ve made this recipe with a local North Carolina whiskey and a South Carolina tea. Defiant Whisky (defiantwhisky.com) is an American Single Malt Whisky made in Bostic by Blue Ridge Distilling Company. 94 years after Prohibition, 13 companies were allowed to open to distil and sell gin, rum, vodka, apple brandy, honey liqueur, and whiskey. Tim Ferris, a former commercial diver, opened his distillery to make 4 ingredient whiskey: water from the Blue Ridge Mountains, yeast, two-row premium barley, and hand-selected American white oak aged and toasted in a proprietary process. American Classic Tea Pyramid Bags are made by Bigelow Tea (bigelowtea.com). Over 100 years ago, tea planters brought tea bushes to Charleston from China and India. The Charleston Tea Plantation restored the descendants of the tea bushes in the lush subtropical environment of the tea farm. The Sidecar is a drink that is not mentioned often in pop-culture, however, it is on the Top 5 list of any good bartender. It is also a cocktail with a muddled and unverifiable history. It was created during World War I in London or in Paris… or maybe in New Orleans. One version of its creation sets its origin in 1920’s Paris at Harry’s New York Bar. The tale is of an American Army captain who would arrive in a friend’s motorcycle sidecar. In some versions, he drove the motorcycle with a sidecar. The bartender believing the captain arrived too early for such a hard drink… or at the request of the captain… added lemon juice and Cointreau to cut the alcohol of the Cognac. Perhaps it was invented prior to World War I, in 19th century New Orleans. In Dale Degroff’s book “The Essential Cocktail” he says that the Sidecar was the term used for the leftover liquor poured into shot glasses. We’re putting a Southern spin on the Sidecar. Instead of cognac, we’ll use bourbon. Specifically, Lewis Redmond Bourbon (darkcornerdistillery.com) made by Dark Corner Distillery in Greenville, South Carolina. Dark Corner Distillery is a craft micro-distillery that produces small batches of whiskey, gin, absinthe, and moonshine. Lewis Redmond was a 19th-century outlaw, the moonshine Robin Hood. A fugitive who hid out in the Appalachian mountains. His reputation for high-quality moonshine was known throughout the land. He made home deliveries until a day in May 1876, when Deputy U.S. Marshall Alfred Duckworth confronted him at gunpoint. A few years later, he was granted a pardon by President Chester A. Arthur in 1884. If you want a quick drink, no problem. We’ve all been there. Pour some Carolinian Crock Pot Spiced Cider into a mug. Warm it in the microwave for a few minutes and add a bit of rum. We recommend Queen Charlotte’s Reserve by Muddy River Distillery (muddyriverdistillery.com) in Belmont, North Carolina. The dark caramel color of the rum is directly derived from aging in virgin American white oak barrels. If Queen Charlotte’s Reserve is sold out, try Muddy River’s award-winning Silver Carolina Rum.